I have seen online many beautiful recipe binders created by full-time homemakers who have master’s degrees in scrapbooking or just great skill in making things look perfect. Daniel and I are part-time haphazard homemakers, both of whom like to cook, so we have had to come up with a method of recipe storage that works for both of us and fits our shared values by being inexpensive and environmentally friendly. It doesn’t need to look gorgeous to please us–in fact, it’s better if it doesn’t because I am going to use it while cooking, which means blips of sauce flying in all directions. (Daniel is much more coordinated than I am.) Also, it’s important to us to be able to get recipes into our system quickly, without waiting until we get around to making them look nice. So if you have been craving an organized way to store your recipes, but you don’t want to spend any money on materials or you despair of making anything so pretty as you’ve seen online, you are lucky that I am home sick for the third day in a row and succumbed to a whim to take some pictures with my iPad. This binder was discarded by my dad’s office. It looked a lot sturdier than the vinyl-covered, ripsy-hinged binders I had been using for school, so I recovered it using some fabric left over from a dress my mom made me the year before and (on the inside) some Con-Tact Paper left over from covering the shelves in my bedroom a few years earlier. I used this binder for sixth grade. 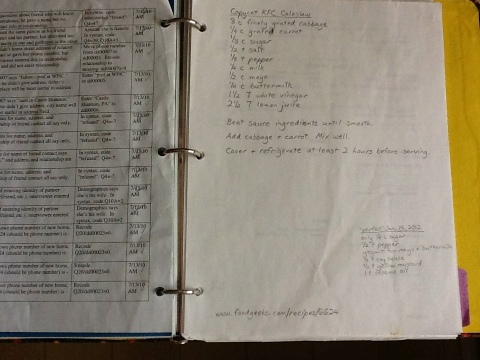 Then I got a new one for seventh grade, but this one was still good, so I used it for various projects over the years…until we decided we wanted our recipes in a binder instead of on cards in a box. We are determined to run this binder into the ground! Of course, different families may have different categories of recipes. Within each category, we put the recipes in alphabetical order. That means it’s important to give them titles we can easily remember; if we repeatedly have trouble finding a recipe because we’re wanting to call it something different, we can change its title. When I find a good recipe online, I write it on a sheet of scrap paper. (Why not print it? Well, at work I am not supposed to print things for personal use, and at home the only printer is connected to Daniel’s computer, which I hardly ever use.) 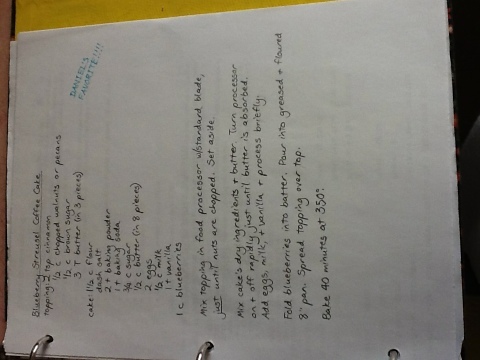 I write the URL of the recipe at the bottom. Shown here is the Kitchen Stewardship recipe for Chickpea Wraps. If we try some changes to a recipe, we note them in a previously blank area of the page–see those notes toward the lower right? Although I originally concluded that this was the very best coleslaw recipe, I have been tweaking it! I’ll need at least one successful repetition before I publish an update. 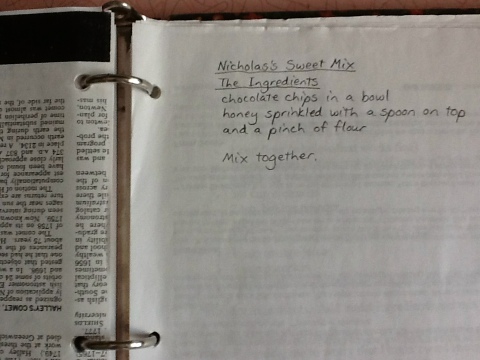 This recipe has a special notation in memory of Daniel’s grandmother, who was fond of fine-point Sharpie markers and of exclamation points. This is what she had written next to this recipe in the cookbook that had come with her food processor. This is the cake I bake for Daniel’s birthday almost every year. It is absurdly buttery and so delicious! Lastly, here is a recipe my son solemnly asked me to write down in his exact words, after he invented it. He was about 4. I don’t think we will ever make this again (although it was a lot more edible than this granola invented by a 4-year-old!! 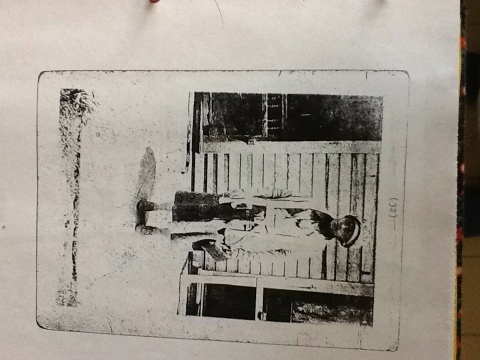 ), but I wanted to honor his interest in cooking and in contributing to the family recipe binder. 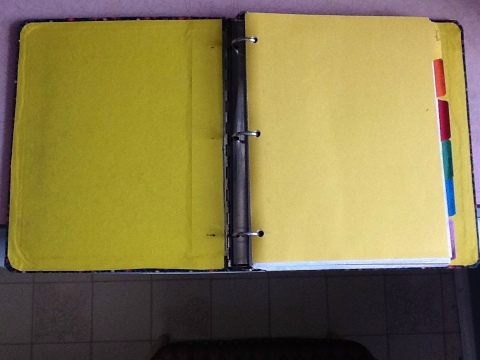 This recipe binder works for me! Visit Your Green Resource and Waste Not Want Not Wednesday to learn other less-wasteful ways to do things! Visit Kitchen Tip Tuesday and the Hearth & Soul Blog Hop for other kitchen-related ideas! 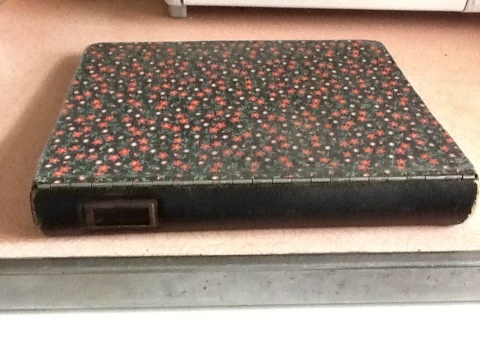 I have a similar binder, though not as pretty! Mine was formerly used my my SIL for many years and it’s hard plastic and apparently indestructible. Anyway, I added a “to try” section. I am always collecting recipes and I don’t add anything I haven’t actually made to my binder but needed a place to hold them till I tried them! 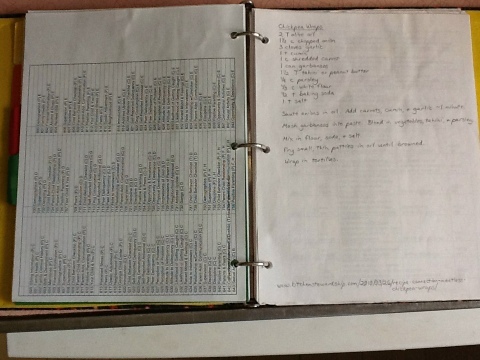 I also keep an index on-line of where all our favorite recipes come from as many of them are from cookbooks on my shelves and I can’t see wasting paper to make another copy. This way, when I’m gone, my kids will know our favorite pancakes on pg 403 of the big white book, and my mint jelly comes from the White House cookbook, etc. I like the indexing idea! Handwritten on scraps of paper is infinitely superior to a printed version. I have a recipe book inherited from my Aunty Margaret. Inside the cover are the details of everyone’s wedding cakes which she made and decorated. Scattered through the book are scraps of paper she has written recipes on, the book smells of soot from her open fire where she cooked in the winter. Bet she never thought that all these years later her scraps and scribbles would mean so much to her niece.